uplift, inspire, activate, cleanse and heal. Channelled, written and read by Magenta Pixie. Suitable for beginners or advanced users, working on multiple levels. Each person will receive what they need at that time, can be used over and over again as you awaken and progress along your path to enlightenment. The opening, closing and protective mechanisms are interwoven into the meditations themselves. They can be used as guided meditations or listened to during deep relaxation, hypnosis or sleep for subliminal activation, healing, stress release and chakra balancing. These meditations are especially created for individuals undergoing a conscious ascension or evolution process and are for anyone who wishes to work on themselves on all levels. 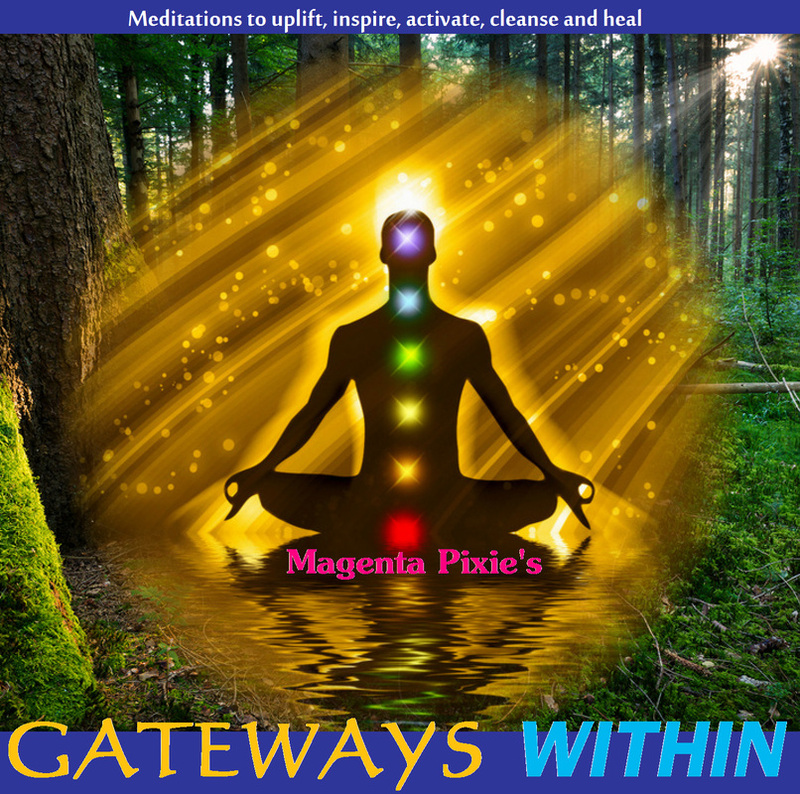 A meditation to connect with higher self, spirit guides and beings from other dimensions. To activate preincarnate DNA memory. To awaken clairvoyance and clairaudience and move into channelling. A meditation to connect with unity consciousness and experience the Zero Point. To accelerate expansion, enlightenment and ascension process. To trigger the ability to balance future and past timelines and draw them into the now. To trigger quantum self awareness. To raise frequencies to match the fifth dimensional and the energy of the planetary and cosmic shifts. A meditation to empower, uplift, balance and heal. To trigger creativity, clairvoyance, conscious and subconscious communication. To activate the Merkabah geometry travel and connect to the higher dimensions. To trigger “beyond the theta” brainwave states of consciousness. To connect with the elemental realms and inner Earth frequencies. To activate light body awareness and conscious dream travel. A meditation to trigger DNA memory both personal and universal. To align with past, future and quantum selves. To move into deep communication with DNA or God self. To open the inner vortex to galactic awareness and extraterrestrial memory. To shift higher awareness of time and activate codes for mental time travel. A major key for ascension. A meditation to cleanse and release negative energies on all levels from past romantic relationships and current romantic relationships that no longer serve you. To upgrade your relationship into the highest resonance through the cleansing of the physical feminine vehicle. To awaken and activate Twin Flame energies within you and draw the Twin Flame relationship into your life. A meditation for healing and rebirthing. This meditation is primarily for women. A meditation to cleanse and release negative energies on all levels from past romantic relationships and current romantic relationships that no longer serve you. To upgrade your relationship into the highest resonance through the cleansing of the physical masculine vehicle. To awaken and activate Twin Flame energies within you and draw the Twin Flame relationship into your life. A meditation for healing and renewal. This meditation is primarily for men. "Divine Feminine - Goddess Awakening"
A meditation to activate creativity, trigger relaxation and healing. To align the heart chakra and experience unconditional love, bliss and higher connection. To awaken the divine feminine Goddess energy within, balance the masculine and feminine energies and both hemispheres of the brain. To bring awareness into universal alignment and trigger synchronicity within life. To empower the knowing that one is 'all that is' in human form. Payment can be made via PayPal using any currency, it will automatically be converted into US Dollars. Click the purchase button next to the product you wish to buy and follow the payment instructions given to you by PayPal. Upon completing purchase, PayPal will redirect you to the download page for each product.